UPDATED: Thu., Aug. 3, 2017, 3:50 p.m.
From the likes of Johan Cruyff and Diego Maradona to today’s global soccer stars, here’s a look at some previous landmark football transfers following Neymar’s move to Paris Saint-Germain. The three-time Ballon d’Or winner made headlines when he joined the Catalan club to be reunited with coach Rinus Michels, in an era when international transfers were rare. The move paid off as Barcelona went on to win the Spanish title for the first time since 1960 that season, and the “Total Football” promoted by Michels and Cruyff became the club’s style of play. Cruyff returned to Barcelona as manager in 1988. Napoli’s rise to prominence coincided with the arrival of Argentina genius Diego Maradona after club president Corrado Ferlaino broke the world transfer record. Maradona helped the club win two Serie A titles in three years and the UEFA Cup. But his stint in Italy had a bitter ending as Maradona left the club after testing positive for cocaine. Juventus and Fiorentina fans were already bitter rivals before Baggio’s departure in 1990 added fuel to the flames. Baggio had been a fan favorite in Florence and a large section of the club’s hard-core fans took to the streets to voice their anger when it appeared certain their idol was heading to Turin. Dozens of people were injured in riots, but Baggio left, later saying: “Deep in my heart I am always purple,” the color of Fiorentina’s shirts. Shearer was expected to join Manchester United following the 1996 European Championship, but Newcastle manager Kevin Keegan managed to convince the striker to sign for his hometown club after a last-minute meeting. Shearer won the Premier League title with Blackburn but could only help Newcastle become a runner-up in his 10 years with the club. After just one year at Barcelona, the Brazil great quickly adapted to the Italian style of play. 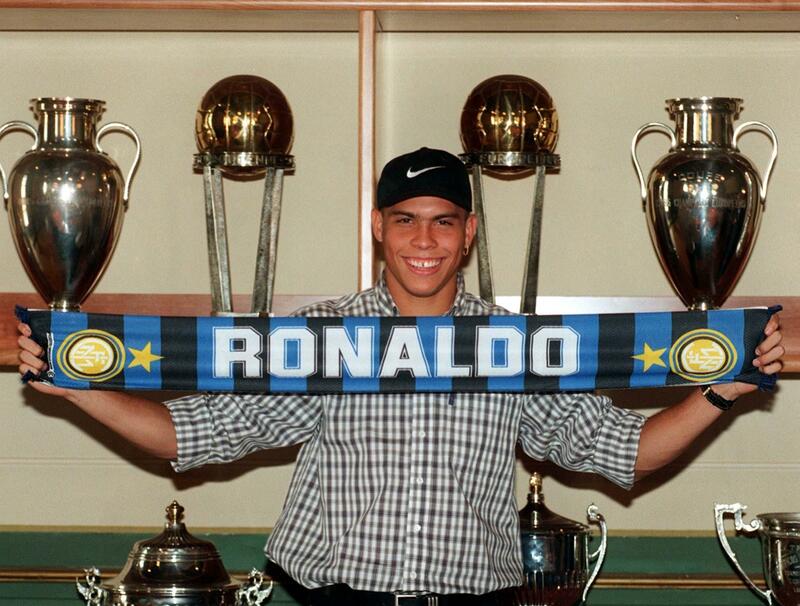 His Inter years are among the best of his career, although his knee problems started in Italy and he only managed to win the UEFA Cup with the Nerazzurri. A fan favorite after five years in Barcelona, Figo was viewed as a traitor for joining Madrid and faced a hostile reception every time he went back to play in Catalonia under his new colors. In 2002, as he attempted to take a corner, he was bombarded with various projectiles including a pig’s head. Figo won the 2002 Champions League and the Spanish league title in 2001 and 2003 with the capital club. Madrid got what they paid for with Zidane, an outstanding player in a team of `galacticos’. He produced magnificent football week in week out, scoring arguably the best goal of his career – an exquisite volley – in Madrid’s 2-1 win over Bayer Leverkusen in the 2002 Champions League final. The following season, he helped Madrid win the Spanish league. A few weeks after signing Kaka for $86 million, Madrid pulverized the previous world record for a transfer when they hired Cristiano Ronaldo. Since then, the Portugal winger has proved his status as one of soccer’s all-time greats, winning the Champions League three times and averaging more than a goal a game for Madrid. More recently, his array of commercial deals has seen him embroiled in a Spanish court case centered on alleged tax fraud. Real Madrid’s second “galacticos” era peaked with the signing of Bale, who joined the current galaxy of stars – Cristiano Ronaldo, Luka Modric and Karim Benzema. In his first season, Bale scored in the Champions League final against Atletico Madrid to help his new team become European champions for the 10th time. Pogba left United on a free transfer in 2012 after his contract expired, but the club had to dig deep to bring him back after the midfielder won four Italian titles in four years at Juventus. United coach Jose Mourinho was hoping for major titles in Pogba’s first season, but had to settle for the Europa League and English League Cup. The Brazil forward’s move has shattered the world transfer record and given Paris Saint-Germain real hope of achieving its long-stated goal of winning the Champions League. After scoring 105 goals in four seasons with Barcelona, Neymar’s five-year contract with PSG should see him emerge from Lionel Messi’s shadow. Published: Aug. 3, 2017, 2 p.m. Updated: Aug. 3, 2017, 3:50 p.m.